As the world’s climate changes hurricanes are turning into super storms, flooding and destroying homes that have never even seen water in their basements before. With the widening flood zones, it is even more important to reevaluate the construction of abodes. By building a beautiful flood-proof home one can be prepared for future storms. Flooding can be overwhelming with loss of homes and belongings. No matter how many sandbags or boarding up windows it is hard to understand the complete devastation that a storm of a huge magnitude can have destroying entire abodes and lives. F9 Productions presents their unique design to conquer flooding, aptly named the Flood House. The thought-provoking architecture design is born from the brains of F9 Productions associates who know first-hand what it is like living in fear of flooding. Team members each spent a portion of their lives residing in a region of Fargo, North Dakota known to be prone to floods. 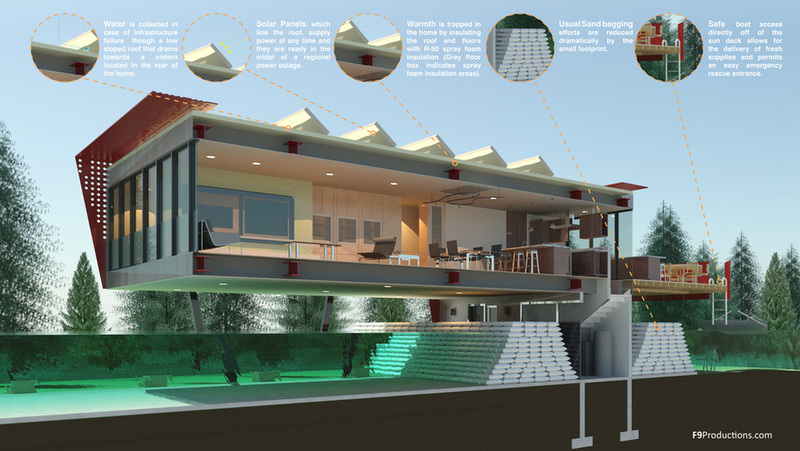 The design of the flood-resistant house came out of understanding the catastrophic loss that would happen if a deluge of storm waters wiped out flood dikes. The designers of F9 Productions, Alex Gore and Lance Cayko, have designed a beautiful home named Flood House. The structure seemingly floats above the ground, daring the wind and waters to try and take it down. The “Flood House” is a stunning structure with amenities designed to protect decor as well as precious loved ones. The raised home design elevates treasured items away from rising waters. The house is built upon an elevated ground plane to protect the main level from flooding. Debris protection is maintained by steel siding panels protecting the home from falling debris and also acts as a shield against large floating objects. All bedrooms, including the master suite, are elevated off the ground level keeping precious items safe from flooding. The washer and dryer is elevated off of the ground along with all electrical outlets in order to protect from any minor flooding. Harsh east and west light is filtered through operable steel siding panels as intense summer light dapples through horizontal sunscreens thus illuminating the interior. 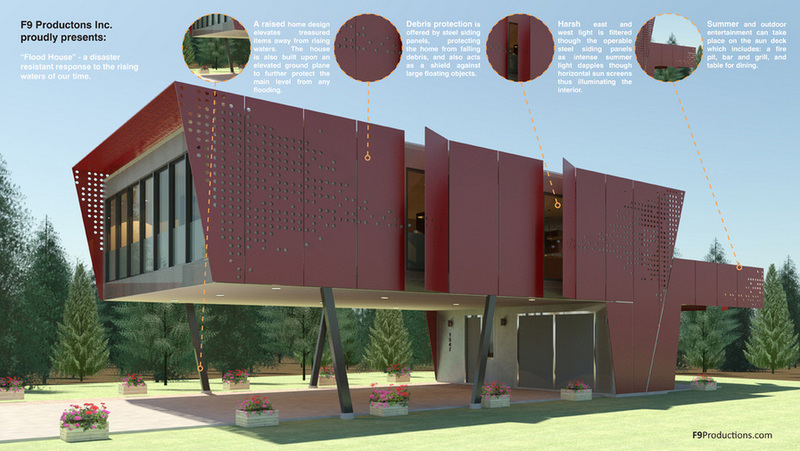 The design allows for sustainability in a crisis as well as survival. Once a storm has passed does not mean the disaster is over. F9 Productions has made sure that the Flood House works to allow for the residents’ survival with water collecting capabilities, solar panels, and even a safe boat built into the design. Water is collected in case of infrastructure failure through a low sloped roof that drains towards a cistern located at the rear of the home. Solar Panels, which line the roof, are ready to supply power during the midst of a regional power outage. The skylight above the dining room filters daylight throughout the space. Warmth is trapped in the home by insulating the roof and floor with R-50 spray foam insulation (grey floor box indicates spray foam insulation areas). Cars are sheltered under the main living level and are warmed by automatic starters in order to fight the severe winter cold. Usual sandbagging efforts are reduced dramatically by the small footprint. Safe boat access off of the sundeck allows for the delivery of fresh supplies and permits emergency rescue entrance. This contemporary abode provides warmth and privacy as well as built-in storage. The use of translucent glass and a gas fed fireplace provides extra privacy and warmth. The designers made sure to locate a prominent storage room in the home’s center for residents’ emergency needs. Privacy is provided by using translucent glass on the lower 1/3 of the windows. Supplementary heat is supplied to the home through the gas fireplace. A main storage wall located in the center of the home provides space for emergency goods, books, blankets, dishes, and other items. With most peoples lives spent attempting to enjoy life without the moments of worrying about a disaster, the Flood House has been designed for enjoying life and entertaining. Those residing in the lovely abode can feel proud to welcome guests into the beautiful sculptured architecture made for living as much as being flood proof. A concrete path leads to the front door. 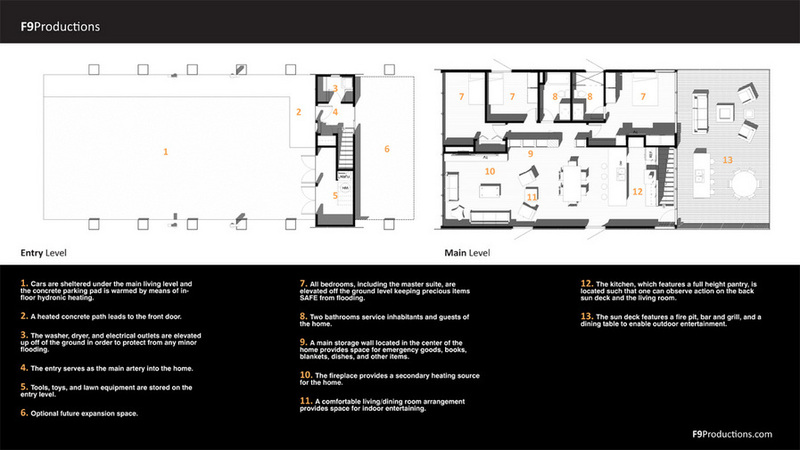 The entry serves as the main artery into the home. A comfortable living/dining room arrangement provides space for entertaining. 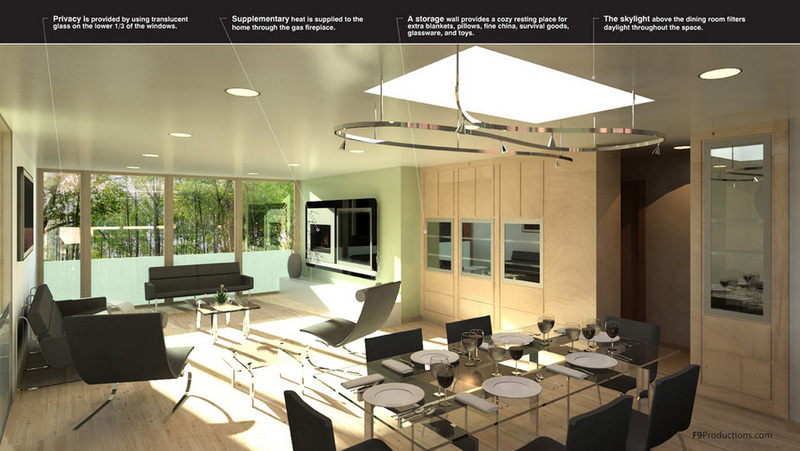 The kitchen, which features a full height pantry, sits where one can observe action on the back sun deck and the living room simultaneously. The sun deck features a fire pit, lounge chairs, a bar, and dining table. Tools, toys, and lawn equipment are stored on the entry level. For a growing household there is room provided for optional expansion space. Enjoy a peaceful existence in the future abode without worry of rising waters. Protect your loved ones and belongings while living in a secured home ready for entertaining and fun. Stay safe and never be afraid to dance!